SolidWorks 2015: 3D Print from SolidWorks! 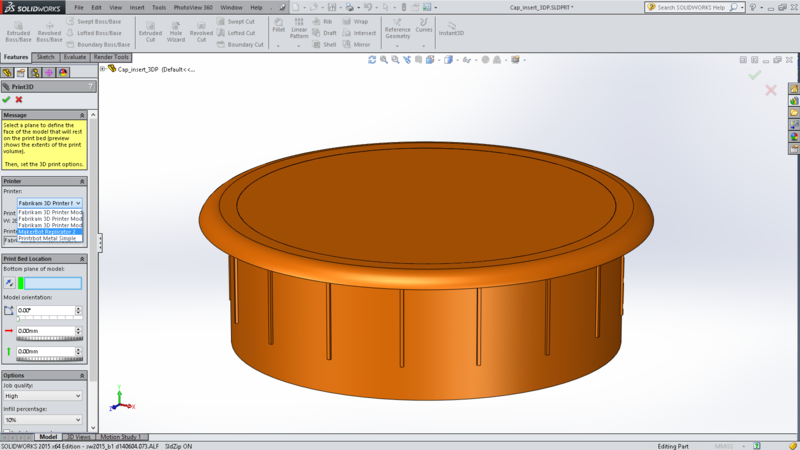 One of the new features I really like is the new Intergrated 3D Printer Support in SolidWorks 2015. You can click Print3D from the Property Manager and select your 3D printer from the dropdown list, just like how you normally print a document! You can choose the printing options like print resolution, optional addition of supports and rafts, volume fill percentage. You can also check if your part fits within the print volume of the printer. Our engineers can now print from their workstation without needing to go down to the 3D printer lab with their STL file! Register now to attend the SolidWorks 2015 Launch event: click here.